This is another work from a photograph. 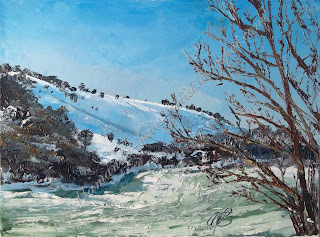 It was a bit cold to sit and paint in the snow, so I took a camera out on my walk - to the same position that I painted Watership Down (1) from - and took a series of shots. I was slightly disappointed that we didn't get much snow this winter - unlike the last two years, which were, as it happens, exceptionally snowy. This, from February, was the snowiest picture that I could manage; as you can see the hill is satisfyingly covered, but you can see vegetation on the valley floor. I started off with a few charcoal lines, then spread the sky on (yup, trusty painting knife in action). I then seem to have worked downwards. The last thing I added was the foreground tree.